Post Ajay Devgn and Emraan Hashmi’s gangster look in their newly launched movie Once Upon a Time in Mumbaai both the actors have been roped by the channel UTV Bindass for their popular reality show called ‘Emotional Attyachar Season 2’. They will be seen in the first episode of the show’s second season. They will be there to check the loyalty between Sanya and Abhay; they would be joined by the cool and smart Pravesh Rana. Pravesh is the host of the show. The opening episode involves tuition pals Abhay and Sanya, who have been experiencing confusion in a strong relation that’s three and a half years old. Abhay approaches the ‘Emotional Atyachaar’ team and proves her infidelity. 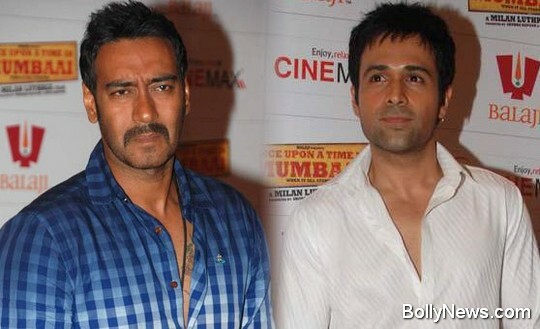 Bollywood’s hot heroes, Ajay Devgn and Emraan Hashmi step in to settle the couple’s differences. The first episode is going to be full of twist. Let’s just say, all that glitters is not gold.